RDU's climb to the top ranking traces back to 2013, when Chief Executive Officer Michael Landguth began revamping air service development efforts. Since then, RDU has landed 10 nonstop destinations, including Paris, and not one of the expansion routes has been dropped. The airport also added four new carriers-Frontier Airlines, Alaska Airlines, Allegiant Air and Virgin America-to its existing stable of six. Now operating at record capacity, RDU is working to add more flights during non-peak hours and will soon embark on a $2.7 billion plan to build a new runway and upgrade gate facilities. RDU's 100-mile catchment area includes 6 million residents and the renowned Research Triangle Park. The academic and economic prowess of Duke University, North Carolina State University and the University of North Carolina at Chapel Hill have attracted a high concentration of national and international firms to the 11-county region. It is said that 80 people move to the Triangle each day. "The Triangle region was and still is growing in both population and wealth," observes Landguth. RDU strengthened its carrier recruiting efforts in 2013 to capitalize on that momentum and potential, he explains. The game plan was to secure talent to help the airport build its business case with carriers, identify new routes and attract new airlines to further diversify its airline portfolio. "Our strategy to build a great team and great relationships with our air carrier partners, has really paid off," reports Landguth. "We are breaking passenger records nearly every month and travelers are really supporting the new routes and airlines. "We feel very bullish about our region," he continues. "We hope to attract more flights and airlines to tap into growing customer demand for both domestic and international flights in the years ahead." "Magic does happen," says Kristie VanAuken, the airport's vice president of Communications and Community Affairs. "The community is strong enough that it will attract air service organically. However, we want it to come faster, and we want it to go to the cities that will benefit the community." VanAuken says that the airport's role in organic (airline-driven) growth and airport-promoted growth is to be a partner that helps offset the start-up risks associated with new routes, while constantly working to understand carriers' needs and concerns. Such partnerships may result in earlier-than-anticipated aircraft upgrades or earlier start dates. RDU's current master plan projects annual passenger growth rates of 2% to 3% for the next 25 years. Like many airports, RDU has an air service incentive program; but VanAuken considers the incentives "just the cherry on top" to complete a deal. "It all starts with a strong business case," she explains, "and that is where we like to start the conversation." Before approaching an airline, RDU's service development team crunches the numbers from a variety of different data bases that slice and dice airline ticket purchase patterns, fares, itineraries and demographics. The research helps prioritize both business and leisure routes, and indentifies the carriers most likely to fly the desired routes. "Years of conversations with the carriers thoroughly flesh out the details before we get into incentives," she says. Unlike many peer airports, RDU largely works without the aid of an air service development consultant. Typically, the three employees who recruit new airlines and develop additional routes with existing carriers turn to outside help only for deep data research. "The core relationship is not with an intermediary, but with the airport and the airline planning department," explains VanAuken. Currently, the team is working to add nonstop service to San Diego. Each day, about 185 passengers depart RDU on flights that ultimately connect with other service into San Diego. RDU is building its case for a nonstop flight by assessing airlines profiles, fleet availability, potential fares, marketing options, etc. "We want to go in there with a strong business case that will be a winner right out of the gate," explains VanAuken. While San Diego is the airport's top domestic pursuit, it is also targeting Kansas City, MO; Portland, OR; and San Antonio. As for the "cherry on top," RDU's current incentive program includes landing fee waivers for the first year and marketing funds. Waiver size varies according to the size of the new destination city. The airport will spend up to $50,000 to promote a new domestic destination, $100,000 to promote a new carrier and $200,000 to promote a new international destination. The airport board adopted the current incentive program in March, a year after the last program lapsed. The new program expires March 31, 2018. In May, RDU marked its first anniversary of nonstop daily service to Paris. During the inaugural year, Delta's new flight attracted 75,000 passengers. As a measure of success and confidence, Delta now uses a Boeing 767, which offers 35 more seats than the 757 it initially used for the route. The airport convinced Delta to add the Paris route with help from the Regional Transportation Alliance, a 10-county coalition of 23 chambers of commerce and more than 100 leading businesses. "You cannot go to the table as a medium hub airport empty-handed," VanAuken explains, noting that Delta had a $50 million to $80 million investment at risk the first year. the form of paid advertising for billboards along major roadways and in-kind donations from members and partner organizations promoting the route within the region, explains Joe Milazzo II, the group's executive director. Ads ran prior to the May 2016 launch, and then again several months later after the initial buzz quieted down. In addition to promoting the new Paris flight, the Alliance also spent tens of thousands of dollars boosting American's existing flights from RDU to London. "We wanted to show our commitment to both airlines for their service to the community," explains Milazzo. American has since updated the daily London route with Boeing 777 service. Previously, it used a 767. Beyond the marketing package provided by the Regional Transportation Alliance, prominent members of the local business community pledged contingency funds in case revenue from the Paris flight did not meet the carrier's expectations. Many of the companies that extended the "good faith" gesture are members of the Alliance, notes Milazzo. Looking ahead, RDU's international wish list includes additional flights to Mexico as well as new service to Latin America-perhaps via a new carrier for the airport, such as Mexico's Volaris or Panama's Copa Airlines. Currently, however, the airport is laying groundwork for service to Asia. "We have demand to support a nonstop to China," reports VanAuken. "It may not be daily, but we will pursue it more aggressively once the new airport in Beijing comes online in 2019." The service development team's research has found that 48 passengers make their way to China from the Triangle region every day. While those numbers may not support daily service, VanAuken says that the market can be stimulated to support three or four flights per week. RDU's catchment area includes the U.S. headquarters of Lenovo, a Chinese computer manufacturer; and Duke has a Beijing campus, she notes. VanAuken estimates it will take three to five years, perhaps more, to secure a China route. Convincing Delta to add service to Austin, TX, was a four-year courtship. RDU is looking to Asia for its next major international flight because another European flight could tax its international arrival facilities, which already handle the London and Paris flights during peak hours. Continuing its history of support, the Regional Transportation Alliance will be ready to help make the push for new service when the airport says it's time, says Milazzo. 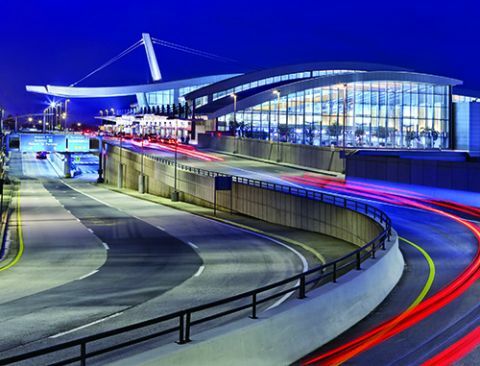 RDU's two terminals, with 41 gates, have either been newly constructed or extensively renovated within the last 10 years. Sometimes, however, they're crowded. "At peak times, we are very full and there are pinch points," acknowledges VanAuken. Adding more flights during peak hours will cause delays and impact the customer experience; so the airport is working to add future routes in non-peak hours. Ultimately, the airlines set flight times, she notes. The airport authority's 2040 master plan outlines $2.7 billion in facility upgrades and identifies another $2 billion in unfunded projects. RDU's primary runway, 5L-23R, is 30 years old and at the end of its life. "The runway is literally the most important two miles of pavement in the Triangle," VanAuken muses. The master plan calls for constructing a new 10,000-foot runway and converting the existing primary runway into a taxiway to free airfield space for additional gates at Terminal 2. RDU has initiated discussion with the FAA to obtain approvals and federal funding for the new runway. Unlike many airports, RDU has common gates in Terminal 2 that allow the airport to shift carriers within the terminal. This flexibility is also slowing the eventual need for new gates, explains VanAuken. True to previous form, the Regional Transportation Alliance plans to help the airport implement its 2040 master plan. "We have made this a top priority," Milazzo says. The group recently supported the airport authority's efforts to secure a $52 million appropriation over the next two years from the North Carolina legislature to help fund elements of the master plan; those recurring state funds were approved in June. The Alliance also plans to make a case for complementary federal funding. "We think the world of our partners at RDU and what they have done for the community," says Milazzo. Clearly, the regional business community has embraced the mantra that guides Landguth and his team: "Air service development is economic development." The Airport Connectivity Quality Index is a mathematical formula based on flight schedule data that assesses the frequency of flights, number of seats and the connectivity quality and quantity of each flight destination. The model weighs the connectivity value of each flight so a flight to a large hub airport ranks more than an additional flight to a small destination airport. A Massachusetts Institute of Technology (MIT) research center introduced the index in 2013 as a new measure to assess the connectivity of individual airports to the global aviation grid. Earlier this year, InterVISTAS updated the 2013 report using the MIT research model and original data. William S. Swelbar, a member of the MIT research staff, co-authored the original 2013 white paper, and also wrote the 2017 follow-up report as an executive president of InterVISTAS. Recently, Swelbar joined Delta Airport Consultants as chief industry strategist.